At 37 weeks and 2 days pregnant, my days of crafting will soon be over – at least for some time. 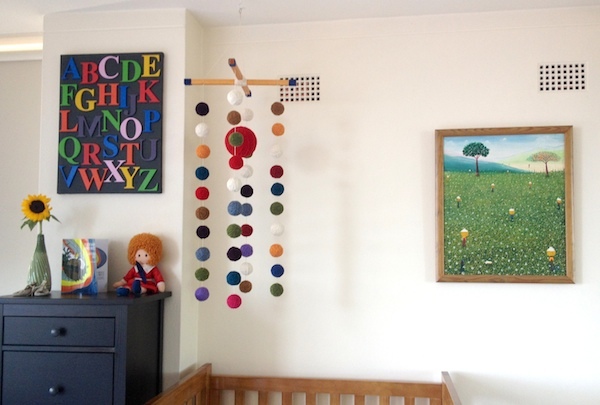 So after the successful completion and installation of my handmade nursery yarn mobile, I spent the last two days making a piece of art for over the baby’s chest of drawers while I still have the time and energy. 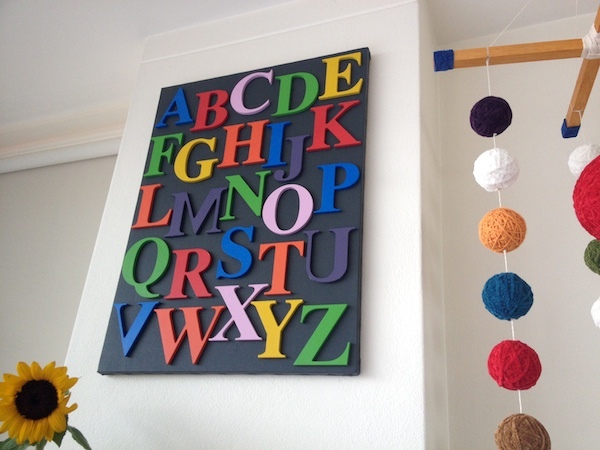 A traditionalist to some degree, I was particularly keen on making some sort of alphabet art, but the recyclist in me wanted to use things I already owned. 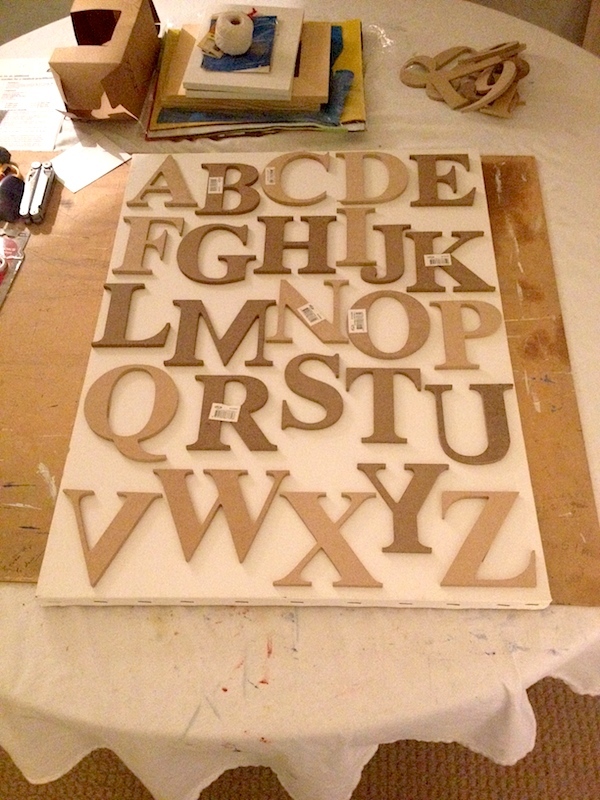 The compromise was to use a blank canvas that had lived under my bed for a year and my old acrylic paint with a set of MDF letters from the local hardware store. The fun part of this project was in trying to work with the materials on hand. Because I’d insisted on using the 18 in x 24 in canvas I already had, I was forced to make the letters fit by randomly staggering them. The effect is quite different from an ordered and equally-spaced arrangement. 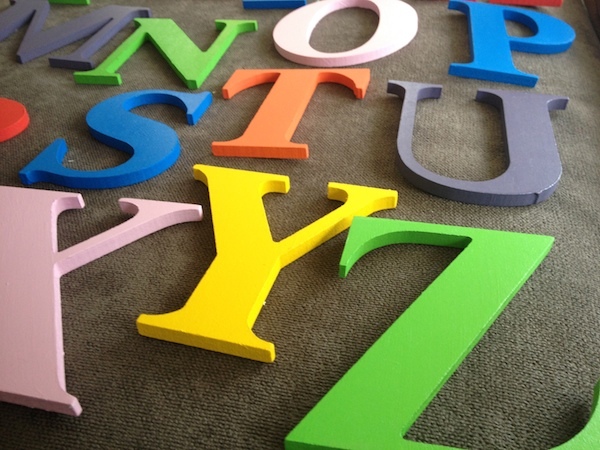 I painted the letters one colour at a time, mixing my own colours rather than using paint straight from the tubes. 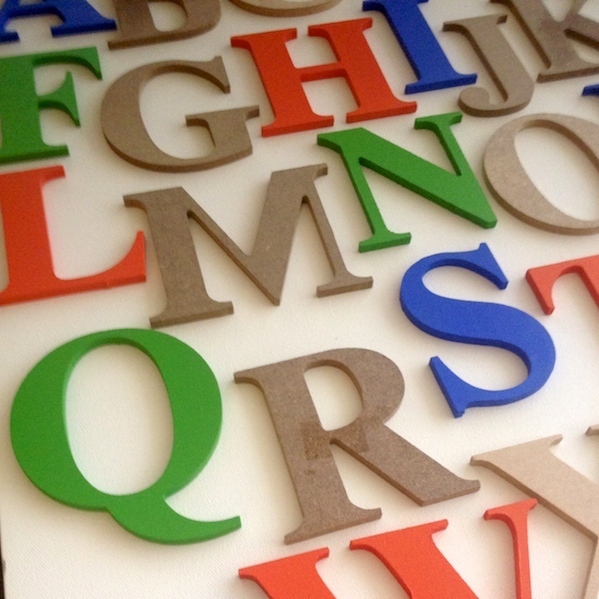 To ensure that no two letters of the same colour were too close together, I made a Microsoft Word version of the final colour arrangement before beginning, but still re-evaluated my colour arrangements as I worked. 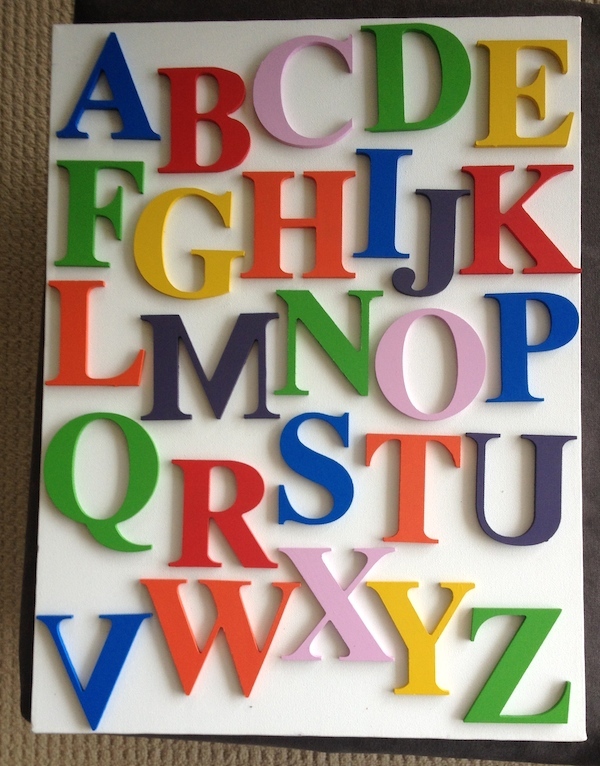 After all the letters had been painted, I considered the background. The white looked fresh, but unfinished when considering the piece as a whole. As suspected, the colours popped! My husband thought as much too, and declared unequivocally that dark grey would be a superior background to a printed page. 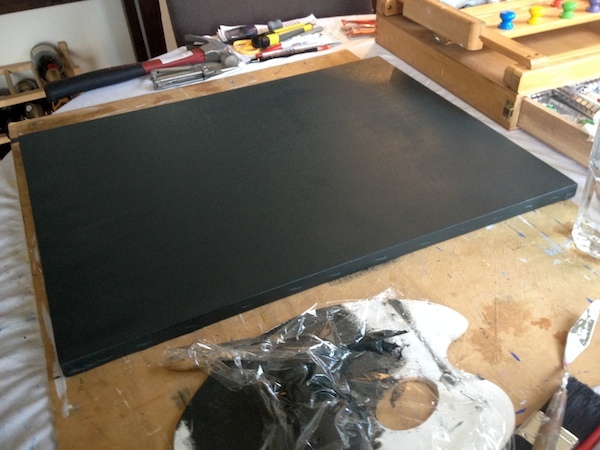 So I made my own grey paint – always a better choice than simply mixing black and white. There’s an infinite number of shades of grey, some cooler, some warmer. Using the remainders of my blue and purple paints, I added black, white and yellow oxide to make a rich, warm colour. The result is a bold and individual take on a thoroughly unoriginal idea. 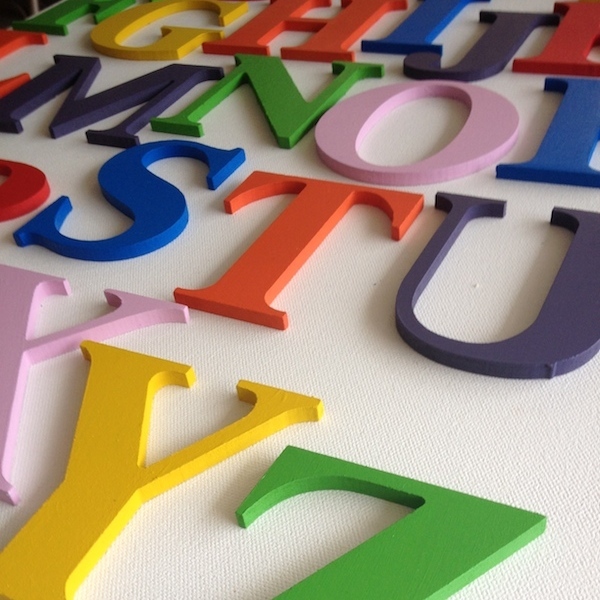 It’s a bit in-your-face, this artwork, with its letters so large, bright and crowded. But as it hangs quite high (and alone) on a clean, white wall, its energy feels contained. 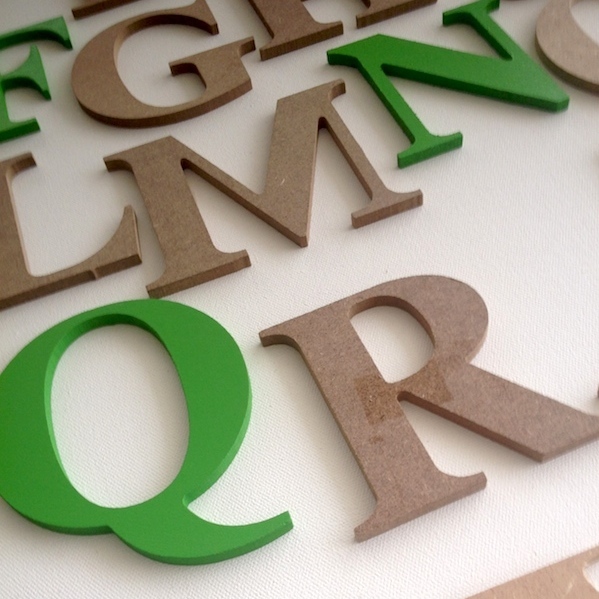 At $1.83 per MDF letter, and with 26 letters to buy, this project ended up costing much more than I would’ve liked, but it was quick and easy to produce. And while it’s by no means a great piece, it is fun without being garish or cheesy. 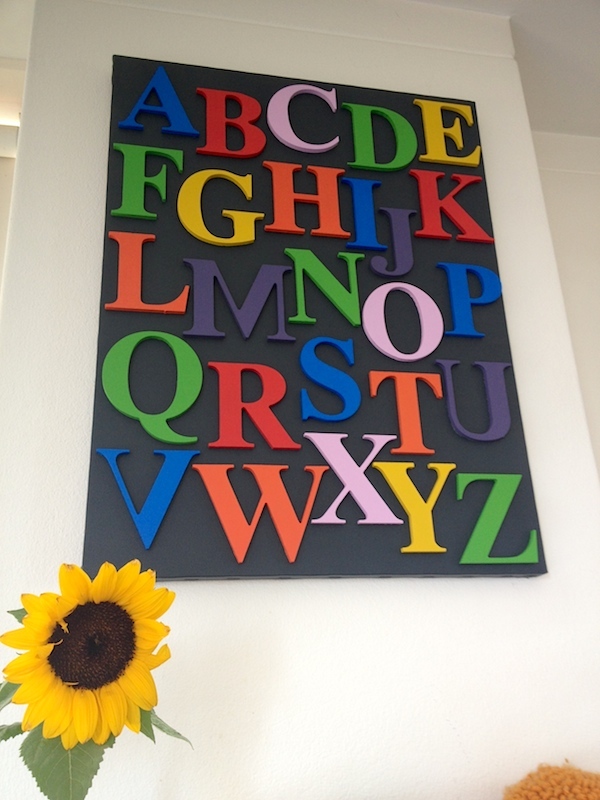 Moreover, seeing as there are no cartoon monkeys, butterflies or bumblebees painted on the letters (Google nursery alphabet art), I see no reason why it can’t can’t find a home on our walls for many years to come – even after our son has moved well beyond his A-B-Cs. 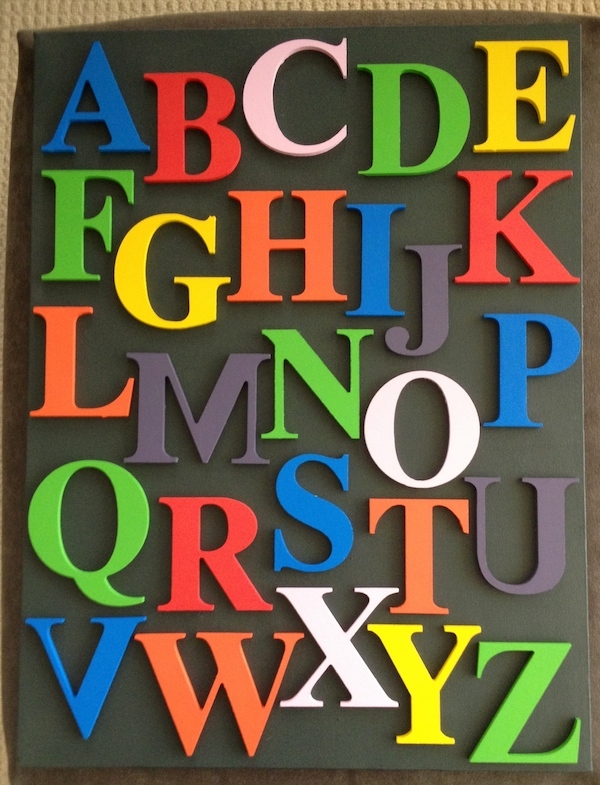 Nice piece for any room in a person’s home!